Evian has launched the second stage of its popular global 'Amazing Baby & Me 2' activity, which features the mini Spider-Man character solving people's dilemmas on Twitter in a campaign run through We Are Social. In the first stage of the campaign, Spider-Man met his own inner child, a baby version of the webslinger, which appeared when he saw his reflection. The creative coincides with the cinema release of ‘The Amazing Spiderman 2’. Building on the idea that there’s a "super-baby within everyone", Evian is providing answers to people's problems online through Twitter. Followers of the brand’s account will be invited to share their dilemmas using the hashtag #AmazingBabyRescueMe, and Evian will respond with "creative and funny" solutions in the form of humorous tweets, Vine video content and illustrations from the Amazing Baby character, via the global Evian Twitter account. It will also surprise some social media users with a personalised response from the Amazing Baby character. The campaign content will then be added to a specially created Pinterest board. Laurence Foucher, Evian global digital manager at Danone, said: "To build on the success of The Amazing Baby and Me 2, we wanted to encourage people to engage with, rather than just watch, the film. 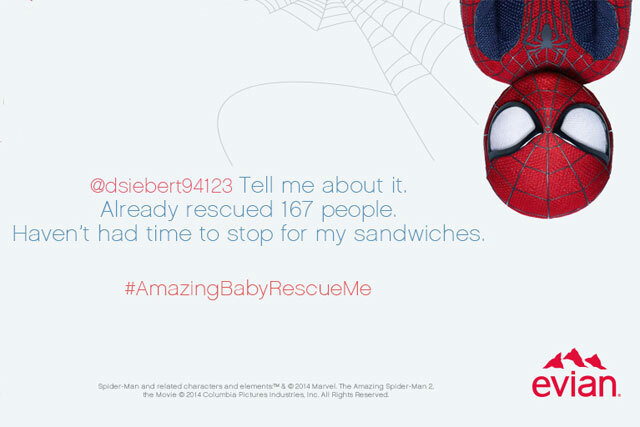 "Using social media platforms, we’re able to bring The Amazing Baby & Me 2 to life and leverage fans’ excitement in the weeks following the premiere of The Amazing Spider-Man 2 film release." Evian will also use its Facebook page to launch a competition, asking fans on the social media site how they would make the most of having a "secret Spidey sense". Deola Laniyan, senior account director at We Are Social, said: "People will often use Facebook and Twitter to discuss new film releases, and this campaign will tap into this by allowing people to engage with Spiderman concept, reinforcing Evian’s association with the film." The original campaign was created by Evian’s global agency BETC Paris through a partnership deal between Evian and Sony Pictures distributors of ‘The Amazing Spiderman 2’.